Length: 7 hrs. 51 min. 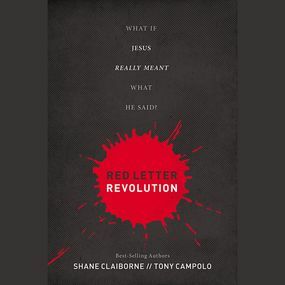 Framed as a captivating dialogue between Shane Claiborne, a progressive young evangelical, and Tony Campolo, a seasoned pastor and professor of sociology, Red Letter Revolution is a life-altering manifesto for skeptics and Christians alike. From the power in Washington to the poverty in rural towns to the broken systems everywhere else, the world is looking for salvation. But this salvation is not just for people’s souls—it’s for schools, governments, churches, and families. Red Letter Revolution is about politics, but it’s fresh. It’s about theology, but it’s real. It’s about economics, but it’s interesting. It’s about Jesus, who longs to transform the world despite the embarrassing things his followers have done in his name. For conservatives and progressives, skeptics and believers, Red Letter Revolution undertakes the world-shaping mission to understand how Jesus’ words could change everything—if we’d only give them a chance.